Well there is an important point to keep in mind while using this tool. This tool cannot be used against any website or any database server. This tool actually uses the SQLi vulnerability of database server and use the servers own resources to bring the website down. MySql is the prime target of this tool. You will see lot of information about perl. This will ensure that perl is working fine. Now place the downloaded script in any directory. In my example I have kept it in my d drive. Now change your working directory to the directory where you saved the script. Now execute the following command. Here Hack URL is the URL you want to target. The URL should be the link that executes some query on the database server. The tool is very effective, a 17-seconds attack from a single machine resulting in a 42-minute outage on Pastebin yesterday. As expected, the Pastebin admins weren't very happy with their platform being used for such tests and tweeted "Please do not test your software on us again." The effectiveness of RefRef is due to the fact that it exploits a vulnerability in a widespread SQL service. The flaw is apparently known but not widely patched yet. The tool's creators don't expect their attacks to work on a high-profile target more than a couple of times before being blocked, but they don't believe organizations will rush to patch this flaw en masse before being hit. This means there are a lot of possible targets out there that will be hit at least once. "This tool only makes you vulnerable if you don't keep your systems patched, perform the basic security, which is how Sony got caught with it's pants down," the RefRef developers said. The tool works by turning the servers against themselves. It sends malformed SQL queries carrying the payload which in turn forces the servers to exhaust their own resources. 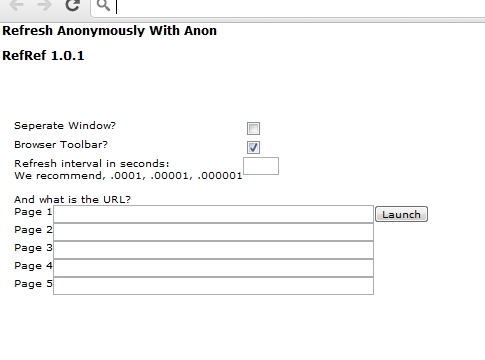 However, the tool's GUI does have a field for inputting the refresh interval so it might combine traditional forms of HTTP hammering with the new technique. Some security experts have been skeptical that the success of Anonymous's DDoS attacks can be explained through LOIC alone. They proposed that some of the group's supporters also have access to botnets, a theory that has partially proven to be correct.